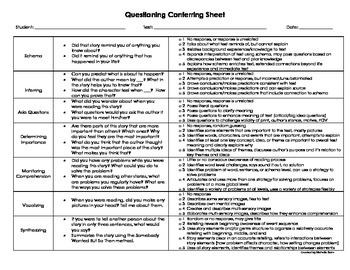 Use this questioning sheet to prompt your individual reading conferences during guided reading, daily five, or other literacy small groups, and keep track of the quality of student responses. Questions are sorted into categories (predictions, synthesizing, etc.) and stated in child-friendly terms. Each category of question has a rubric for easy tracking of student mastery and progress.